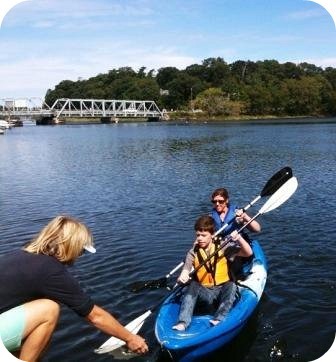 Last year’s 1st-ever “Slice of Saugatuck” took place on a gorgeous September Saturday. No one knew quite what to expect. But — drawn by the promise of fun and food (and beer) (and wine) — thousands of Westporters showed up. 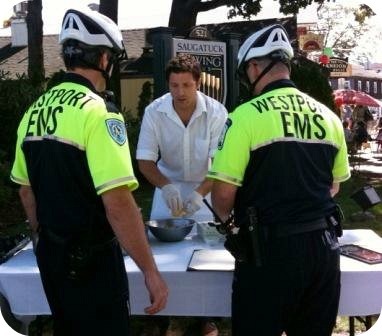 EMTs chowed down at the Saugatuck Rowing Club, at last year’s Slice of Saugatuck. They wandered the funky, quickly changing neighborhood of Saugatuck. They enjoyed plenty of food (and beer) (and wine.) Plus plenty of music, kayaking, hairstyling, fire truck sitting, fly fishing, tae kwan do, people-watching, and friend-meeting. So the expectations are high for this Saturday’s 2nd annual Slice of Saugatuck (September 15, 12-3 p.m.). The ante’s been upped. There will be more food. More merchants. 8 bands, at 5 venues from Bridge Square to Dunville’s. Over 3 dozen restaurants, shops and galleries will open their doors. Folks can wander in and out, tasting their way from restaurant to wine shop and back, checking out everything from kayak rentals and the firehouse to yoga and fly fishing. The weather was perfect last year for kayaking at Down Under. Bridge Square will take a star turn. With 3 more stores — and an additional 3 eateries — since last year, the old mini-shopping center has become a new neighborhood anchor. With so much going on, most people won’t even notice the construction. That’s Phase II of the Saugatuck redevelopment. It’s going well — and quickly. So just imagine how great next year’s 3rd annual Slice of Saugatuck will be. This entry was posted in Entertainment, Local business, People, Saugatuck and tagged Matthew Mandell, Slice of Saugatuck. Bookmark the permalink. There are now 4 more merchants added to the fest in the last few days and misssed the map publication. Retail – ClearTech and Barnett Hill Productions. Also there will be a butchery Demo at 1pm on the Plaza next to the Craft Butchers. Missing out will be the Boathouse, they have a large wedding to handle. Hope to see everyone Walking the Slice on Saturday. visit http://www.westportd1.com/saugatuck for more info….. Thanks Dan for posting this. Last year was great!! Can’t wait! As someone who relocated to Saugatuck this summer, I’ve enjoyed the shops and restaurants. 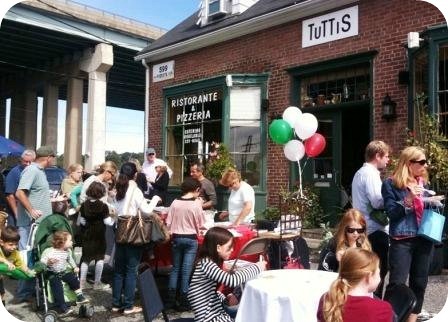 Two tiny eateries that are delightful are Tutti’s, the famous (pictured above) mom-and-pop Italian with ridiculously generous portions, and Papadum, a newer Indian restaurant on Bridge Square that usually seems empty but the adventurous will find terrific, highly authentic Indian dishes (including unusual ones) and a super casual atmosphere. I can’t wait! I had a great time last year!! Thank you for this wonderful event!! What is really amazing is the generosity of the businesses not only providing free samples but also giving up the profits from a day of commerce in what must be a prime shopping time.